From the celebrated author of Swimming at Night, a powerful and moving saga of one woman's struggle to overcome her husband's death and uncover his dark, mysterious past. A young widow discovers her husband was not who he claimed to be--and finds herself falling in love with the wrong man. Eva has only been married for eight months when her husband, Jackson, is swept to his death while fishing. Weighed down by confusion and sorrow, Eva decides to take leave of her midwifery practice and visit Jackson's estranged family with the hope of grieving together. Instead, she discovers that the man she loved so deeply is not the man she thought she knew. Jackson's father and brother reveal a dark past, exposing the lies her marriage was built upon. As Eva struggles to come to terms with the depth of Jackson's deception, she must also confront her growing attraction to Jackson's brother, Saul, who offers her intimacy, passion, and answers to her most troubling questions. Will Eva be able to move forward, or will she be caught up in a romance with Saul, haunted by her husband's past? Threading together beautiful, wild settings and suspenseful twists, A Single Breath is a gripping tale of secrets, betrayals, and new beginnings. 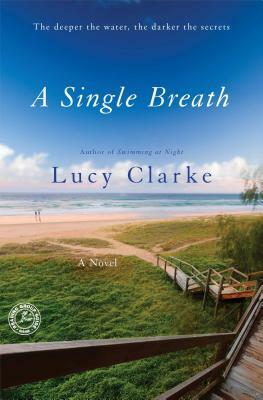 "Alternating chapters juxtaposing the two sisters’ lives engage readers from the start in Clarke’s accomplished debut." "I could not put down Lucy Clarke's engaging debut, Swimming at Night. As Katie searched for the truth about her sister's death, I savored being an armchair traveler to seaside locales around the world."